About 20 boats have been built. 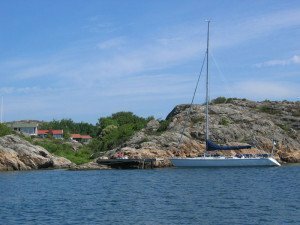 It was the prospective first Atlantic owners who themselves built the casting plug to the hull of Wasa Yachts in Södertälje. It was not a small project, the hull was over 15 meters long – 51 feet! Wasa Atlantic reminds the hull more on Wasa 30 than Wasa 55. This means that she is comparatively shallow and has rounder sections to get less wet surface. The length of the waterline is 12 meters long, which increases further when the boat leans. In winds over 5-6 m/s log Wasa Atlantic steadily reached 9-10 knots when she leans out with a little slack in the sail; she is a genuine “passage maker”. 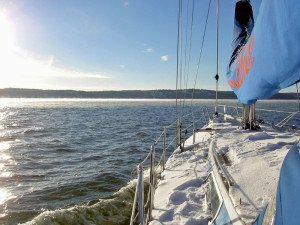 The Atlantic has a wide buoyant stern that lifts with the waves as they roll in from the aft, giving it nice surfing properties and dry sailing. Fin keel in lead runs a moderate 2.15 meter, unusually little on a boat of more than 15 meters with a divided lateral plane. 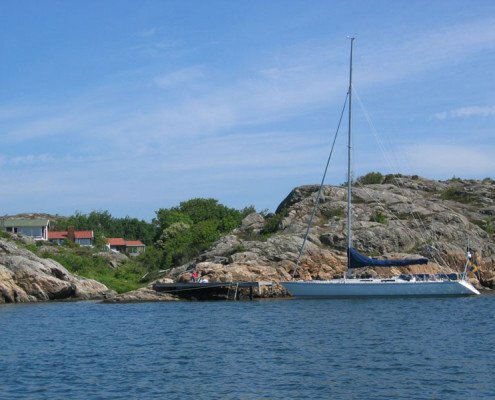 But a cruiser must not be too deep, and with just over two meters, accessibility in both the archipelago and the shallow banks in many of the exotic southern islands increases. 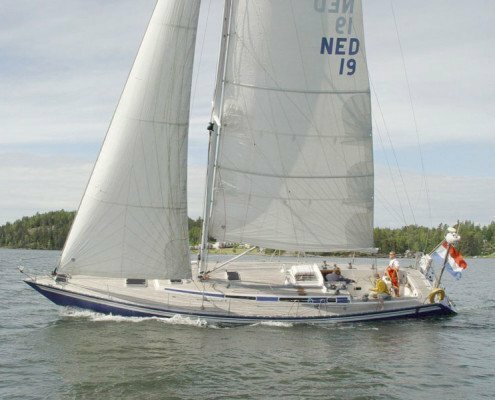 Both the keel and the rudder are dimensioned to give the Wasa Atlantic a stable and steady run with good maneuverability, good characteristics perceived by her owner. The superstructure is low, but the large sailboat hull is still enough to provide an internal height of 1.90 m. Wide side-deck extend beyond the cockpit where they are narrowed but still sufficient to walk on. At the far end there is a small aft deck; The entire design gives Atlantic a harmonious frame that suits her well. The cockpit is deep and spacious, where six to eight people who are well protected. Helmsman has a large steering wheel that allows control from all positions, all the time with excellent visibility ahead. A hatch in the afterdeck leads to a spacious living area behind the cockpit. In the bow is an anchor hatch. The teak decor keeps Wasa’s traditionally high class, solid and elegant. A special detail is the bulkhead in front of the kitchenette and navigation table. Here, you usually see a half bulkhead on each side, but on Wasa Atlantic they extend in an elegant arch out towards the sides and then back up towards the center of the roof, where they join as a narrow side-to-side frame. floor with standing height and double wardrobes. The kitchenette is L-shaped and generously increased, the same applies to the navigation table and to the storage space between the cook and the navigator. 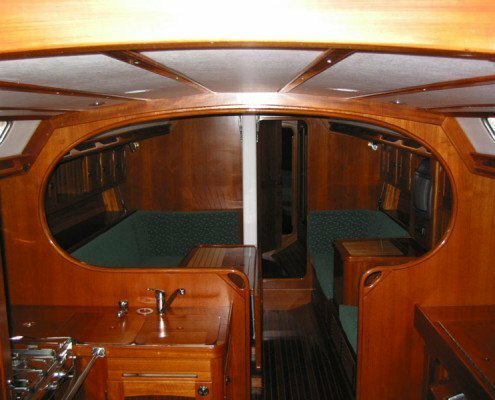 This is the central part of the boat where you gather and move arround, with plenty of space to change your sail clothes, as well as to manage the cooking and navigating. The wet that enters through the hatch stays here, the areas for rest and recreation are kept dry. 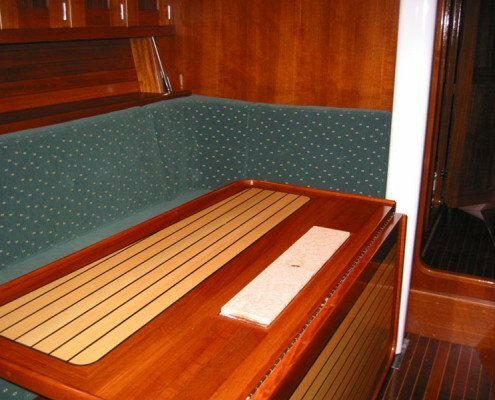 The lounge features a L-shaped sofa to port, a fixed table, and a straight sofa on starboard. Above the backrests are double shelves and several cabinets. The mast comes down in front of the main bulkhead. Here is an unusually spacious toilet / shower opposite to a row of three separate wardrobes. Below and above the double cabin in the forepeak there are additional ample living rooms. The Seldenrigger is of fractional type with double straight spreaders. The mast is continuous, giving it greater strength and support (due to the support of the deck structure). 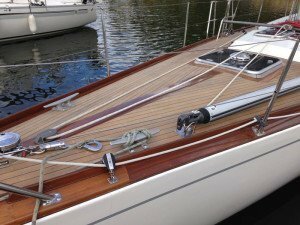 Backstays with checkstays provides trimability and stability lenghtwise of the boat. 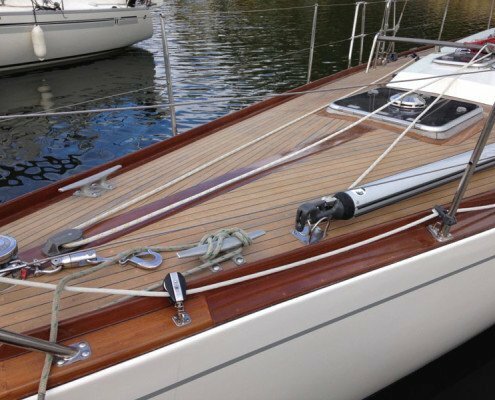 The mainsail of 50 m² is tighten either via a short rail on the cabin roof or on a longer rail directly in front of the steering wheel. 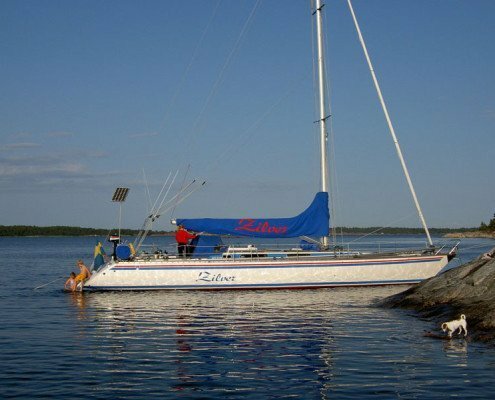 The idea behind the big size mailsail was that the Wasa Atlantic should be able to sail with only mailsail and jib in all weather. 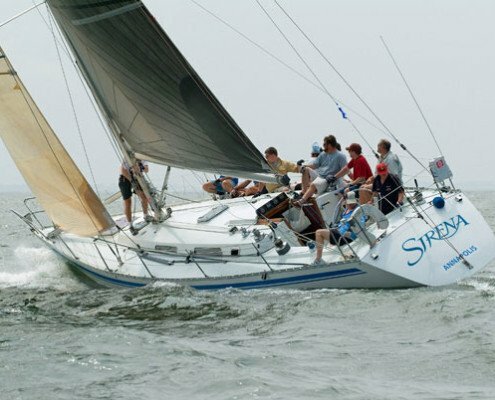 In really light winds, however, some more horse powers in the triangle is preferable, and some Atlantic owners have therefore supplemented the sail wardrobe with a Genoa 1 with 150% overlap. 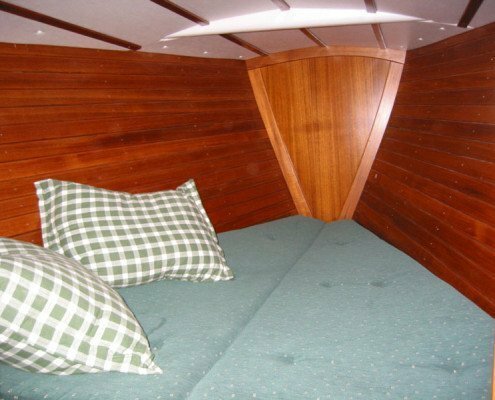 Construction of hulls and deck is made according to Wasa’s common method of balsa as a spacer in the sandwich laminate. Along the keel area, the bottom of the hull is made of a homogeneous and extremely heavy GRP laminate with robust bottom struts. The standard engine in Wasa Atlantic today is a Yanmar 55 horsepower and with sailboat drive.